The wrong way to mount the MeteoHelix weather station: They are not level and the MeteoHelix is on the shady-side of the mounting pole which obstructs the sun sensor. Make sure the weather station is level. Make sure the solar panel on top has an unobstructed view of the sun throughout the whole day. Make sure there in unobstructed airflow to the weather station from all directions. Make sure the rain gauge is level. Make sure there are no obstructions to rain within a 45 degree cone above the rain gauge. Ideally, mount the rain gauge on or near the ground to reduce wind induced underestimation of precipitation. Example of wrong and proper mounting of the MeteoHelix and rain gauge. 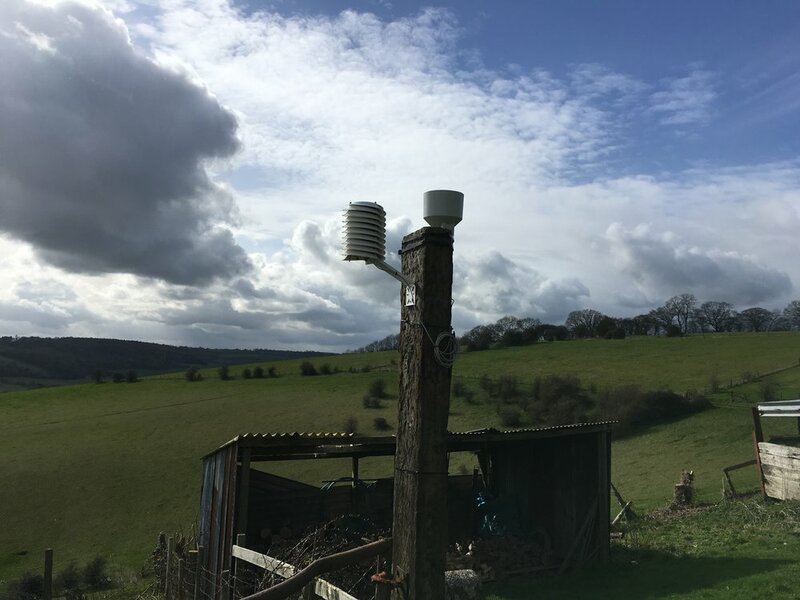 A MORE Correct way to mount the MeteoHelix weather station and rain gauge - both are level and above obstructions to airflow and the sun. IdeaLly the MeteoHelix would be COMPLETELY above the obstruction and the rain gauge on the ground a few feet away from the post.